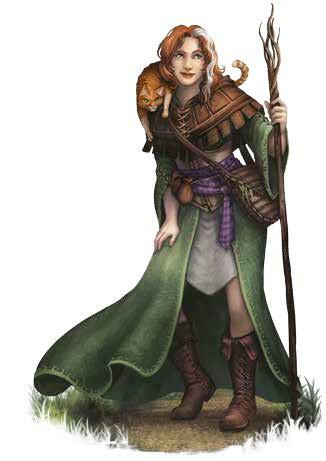 I started out by setting up my play space with Rowena, the Cat Witch from the Transweal. 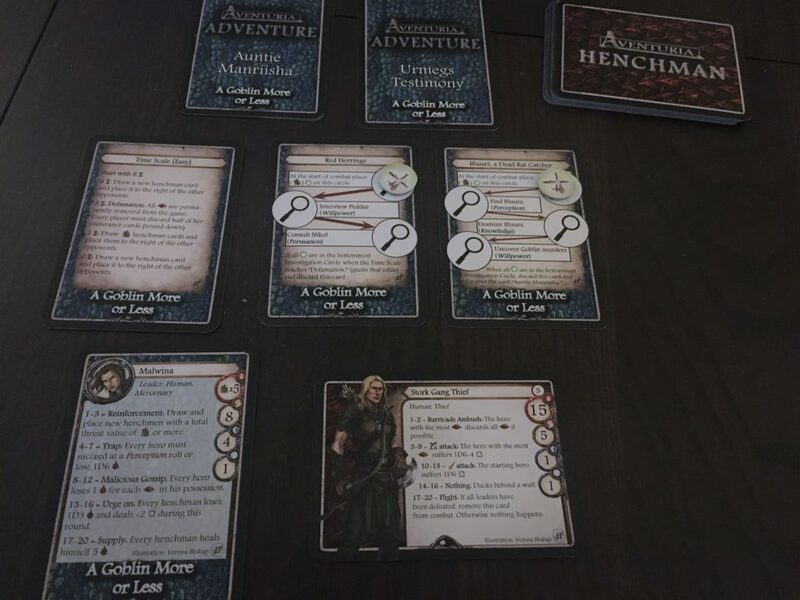 Then, I stepped into the story “A Goblin More or Less,” one of the adventures in Heroes’ Struggle that employs the new Investigation mechanic. Because there is a lot more going on within the combat of an investigation adventure, I roll one skill challenge during the story section (Rowena failed to handle her Tatzelwurm effectively) and proceed directly to the combat and investigation. As you can see, there’s quite a bit going on. At this point, victory is not even possible, as the leader you see here (Malwina) is not the one I must defeat to win. Instead, you can see that there are two Investigation cards set up in addition to the Time Scale and villains. 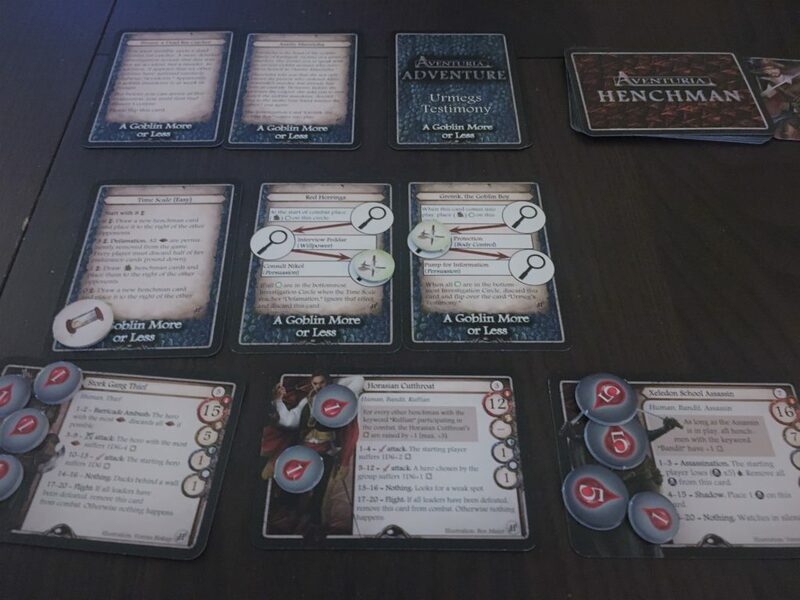 There are two other adventure cards that will be revealed as part of the investigation process, and each one conceals some part of the final setup. Because every skill roll on an Investigation card works similar to a Hero Action in that it costs endurance, you can very quickly see that there will be a lot of moving parts. Also, this initial setup is a little bit rough. Both Malwina and that Stork Gang Thief have actions that punish heroes for holding on to Fate Points, which is unfortunate because I know that some of Rowena’s cards depend on good Fate Point flow. At this point, the attacks start hitting pretty hard. Malwina gets several Urge On results in a row, which reduces the Life Points of all the henchmen but also increases their damage. Luckily, Rowena is not awful at dodging (she’s right in the middle of the pack), and I am able to use her Solstice card not only for continuous healing but also to burn Fate Points so that I’m not holding any during the villain turns. The Xeledon School Assassin is a ticking time bomb. She has two actions per turn, and what she generally ends up doing is building up towards a deadly strike (on a 1-3) that removes a huge number of Life Points and isn’t even an attack that can be dodged or protected! Rowena has some cards that can keep the Assassin from rolling that awful 1-3 for a while, but I know it’s only a matter of time. 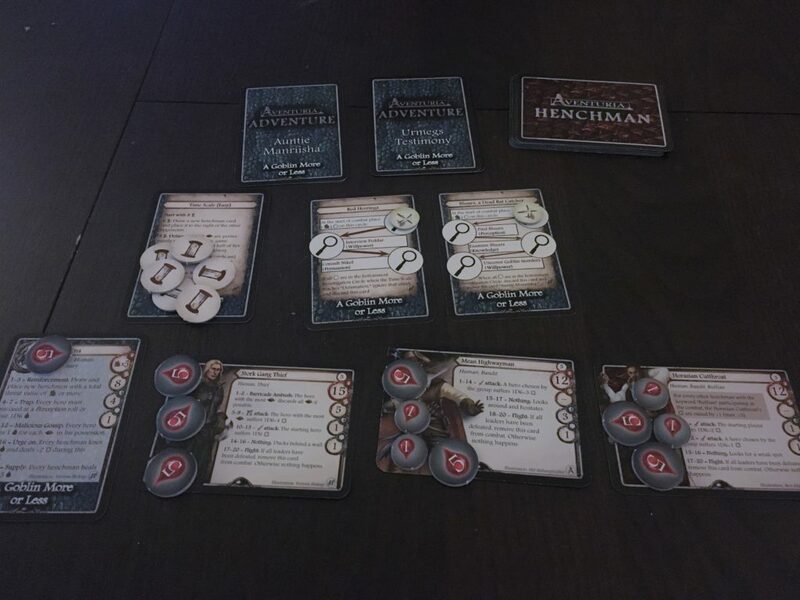 Plus, once the Time Scale hits zero, I will see a new henchman every single turn. Fortunately for Rowena, the last Investigation roll she needs to make is Persuasion, which is her best skill. On the next turn, she reveals the true mastermind behind the whole nefarious scheme and begins attacking! She’s not a big hitter, so it takes two more rounds, during which more henchmen are revealed. But she uses her Invisibility Potion and Dream Shape to control the situation long enough to defeat the murderer and secure her victory! If you are interested in trying out Investigation-style adventures, pick up Heroes’ Struggle from our web store or at your friendly local game shop! I know it can be a tough sell to spend resources getting out her other weapons, but her low close and ranged combat skills can make that fate point flow much better if you can attack three times in a turn. 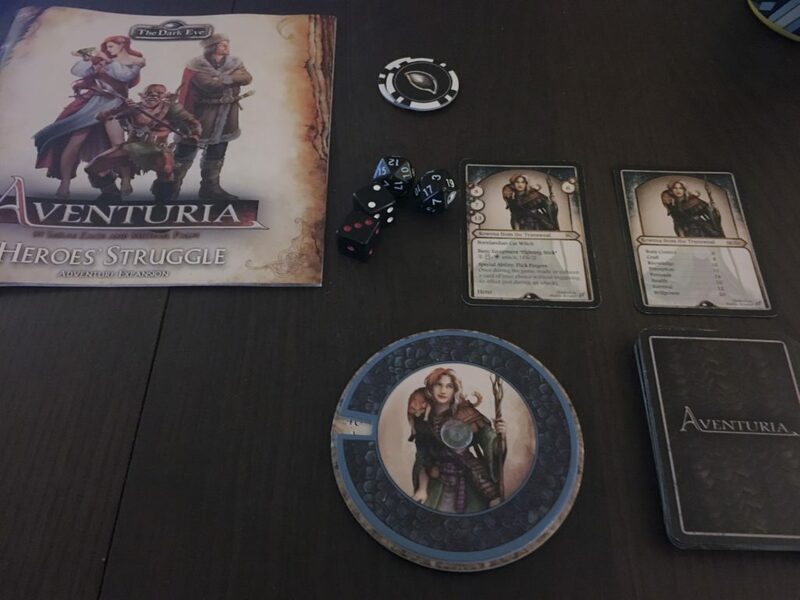 I am totally enjoying Aventuria Adventure Card Game. I played the Silvana, all the Wildenstein, and just started the Forest of No Return. I was wondering if there was a off file for the core rules so I can carry it just on my phone and not the physical rule book. I have the game sleeved and in deck boxes but the rule book is a hassle to carry around. Dean – Because there’s a lot of actual game content in the rules, we don’t have the full files available publicly. But email me at feedback (at) ulissesnorthamerica.com. Let me know what expansions you’ve picked up and I’ll get you set up.